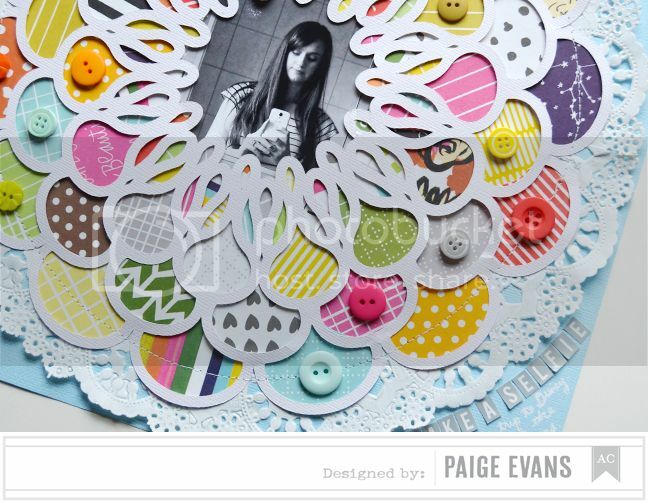 I have a pair of layouts on the American Crafts blog today with a "Signature Style" theme! I first found my style while working in-house at American Crafts back in January 2008. I love to use bright colors, tons of patterned papers, punches, my Silhouette Cameo, watercolors, often quilt-inspired, and lots of repetition. That's my style in a nutshell! DESCRIPTION: Wilna Furstenberg makes the prettiest cut files! 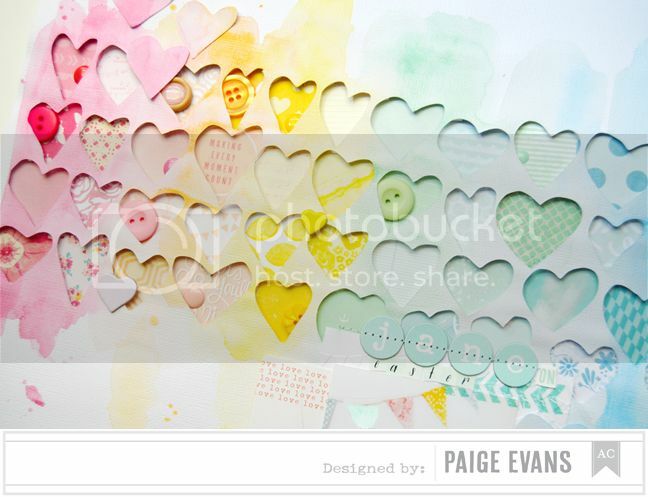 As soon as I saw this whimsical heart design I knew I wanted to use it on a sweet layout about Jane in her Easter best. JOURNALING SAYS: Oh what a pretty and sweet little girl you are dear Jane! You're such a doll and I always want to give you big hugs! HOW TO: Die cut the hearts cut file from white cardstock and leave it on the mat. Watercolor a rainbow of stripes across the top half of and let it dry. I found the paper doesn't crinkle as much if you leave it on the sticky mat while painting. Or use actual watercolor paper :) Lift off the cardstock then back each heart with patterned paper - use foam dots to adhere them in place. Embellish some of the hearts with buttons and enamel dots placing them on like colors. Emboss banners onto white cardstock and use it as a photo mat on the bottom right. Tuck a journaling card under the left side and stamp the date below. Stitch a Thickers title above the photo and add mini alphabet stickers to finish the title. 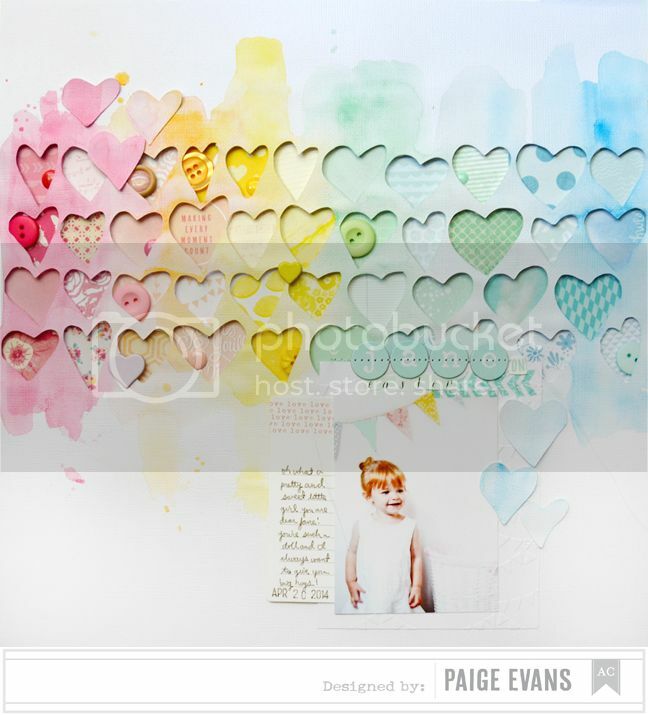 Place a few of the watercolored hearts by the photo and the left left corner. DESCRIPTION: Shameless selfie goin' on here :) I rarely scrapbook pages of myself so it's a nice change of pace every once in awhile. Hopefully my kids and grandkids, great-grandkids, etc will enjoy seeing pictures of their mom/grandma/great-grandma/etc! I used journaling cards and patterned papers from the Sunshine Project Life Edition designed by Elsie and Emma of A Beautiful Mess because I LOVE the bright colors! JOURNALING SAYS: Instead of packing for our trip to Disneyland Paris I took 'selfies' in the bathroom mirror for a few minutes. 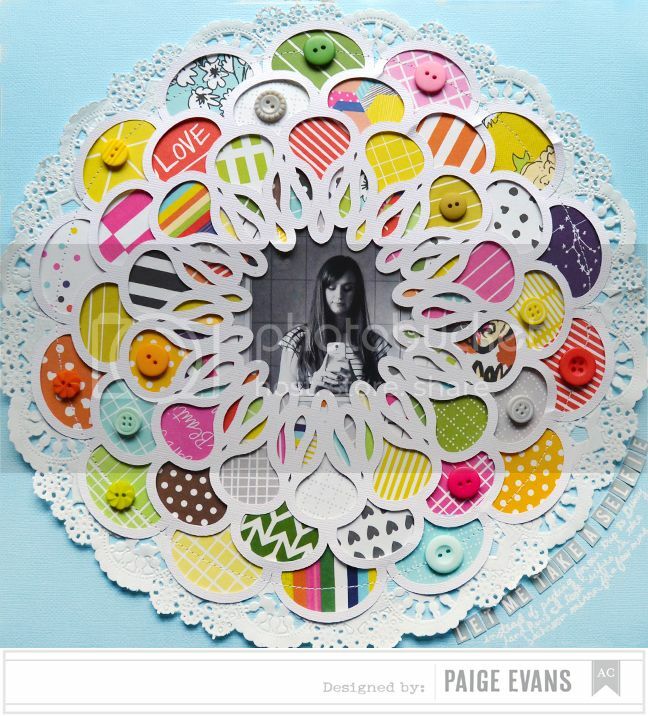 HOW TO: Die cut the Dhalia Flower Mat (Design ID #47089) from white cardstock then back it with journaling card and patterned paper pieces along with a photo in the center. I hand cut every paper piece and placed them with foam dots. Adhere a large doily on a blue cardstock base then stitch the doily to the center. Place tone-on-tone buttons around the layout and add a mini alphabet sticker title around the bottom right curve. Journal below the title with a white pen. What about you? What's your signature style? I'd LOVE to know! love love love your pages and always love seeing your style in action, it's soo unique and amazing!! just awesome projects!I just love the watercolor and coordinating papers in the first project! Love your unique signature style! These are incredible pieces of art! These are gorgeous Paige, and I love your signature style! !